Ah, chemistry. How boring it can be when reduced to a textbook, a monotonous lecture, or a multiple choice test. But chemistry has its roots in ancient alchemies–the attempts to make gold and elixirs for healing or immortality. Watching my kids in action, I think there may be an innate drive to mix substances and solutions to create something new. They began brewing their own potions long before we read Harry Potter. We started simply. Whenever I cleaned out the cupboards or the refrigerator, I would give the girls a giant (and unbreakable) bowl, wooden spoons, and safety goggles, and send them out into the backyard to make some new concoction. Stale or moldy food made for some pretty intriguing science projects. I also had the girls throw in any candy they might find from the back of cupboards or old birthday goodie bags. It was fun and got rid of a lot of junk. When they tired of potions and wanted something more ‘scientificky’ to mix and do, I did a little research and discovered that juice made from a red cabbage is a natural indicator to determine whether a substance is acidic or basic. The process is very simple and straightforward, and the results are colorful and satisfying. 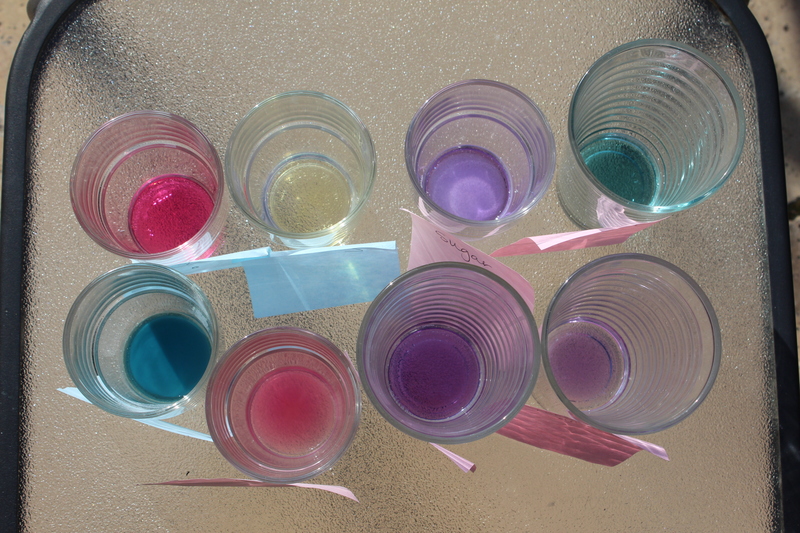 a bunch of small glasses or paper cups, each holding a couple of teaspoons of one of the following substances and clearly labeled: vinegar, sugar, rubbing alcohol, baking soda, ammonia, hand soap, lemon juice, laundry soap, bathroom cleaner, milk, toothpaste, salt, starch, antacid, seltzer water, cream of tartar, et cetera. 2. Put the cabbage in a bowl or open container that can handle heat and cover with boiling water. 3. Let stand for at least ten minutes so the color leaches into the water and the liquid is cool enough to handle safely. While waiting, send your child on a scavenger hunt to collect all of the household products you plan to test, and help them to label each cup accordingly. This is a great time to have the child make a few predictions. Which substances do you think will be acidic, or sour like orange juice? Which ones might not be? 4. Strain the cabbage out of the juice. 5. Have your child pour a couple of teaspoons of cabbage juice into each of the cups and observe what happens to the color of each substance. If the solution is neutral, the juice will remain purple. If the solution is acidic, it will turn pink or red. If the solution is basic, it will turn blue. The first of many rounds of cabbage chemistry. 6. Discuss at any level you find appropriate. Help your child make a chart so they can talk about their findings with other people. It could simply say: Name of substance, color, and then: acid, base, or neutral? The cabbage juice helps determine the pH, or hydrogen ion concentration of each substance. The concentration can range from 1 (extremely acidic, like gastric acid) to 13 (extremely basic, like bleach). All solutions with a pH of less than 7 are called acidic, and those above 7 are called basic. A pH of 7 is considered neutral. For a little more information, try http://www.epa.gov/acidrain/measure/ph.html. 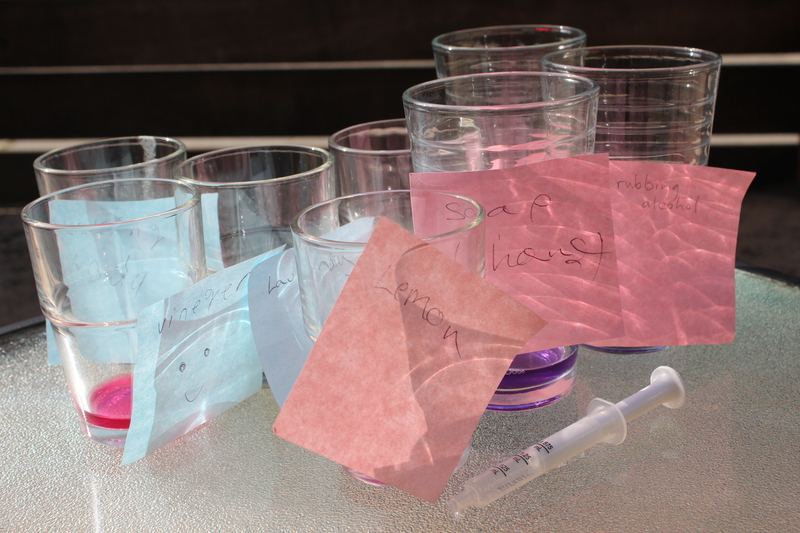 There are many real-world applications for measuring the pH, including everything from chemistry, environmental science, medicine, and oceanography, to gardening and pool maintenance. If you have a hydrangea growing in your garden, for example, the pH level of the soil determines the color of the blooms. **Gina says: I was really, really excited to learn this. I might be testing my neighbor’s soil right now. All of this information could be handy to know if you forget to wear gloves when you dice jalapeño peppers, and your hands get so incredibly swollen and flaming hot that you can’t sleep. Not that I would know anything about that. I can do this! I think I can, I think I can… Ps ps what is a good kid-friendly example of something that is basic? You can TOTALLY do this! By a kid-friendly base…do you mean edible? Baking soda will make a weak basic solution. Sea water is still slightly basic, but is getting more and more acidic every year. For more on that topic: http://in.answers.yahoo.com/question/index?qid=20090628062655AA970He As for something common but totally inedible, ammonia is also basic, sells for about two bucks at the pharmacy, and (bonus!) is the only thing that will get cooking grease off my teapot.